June 18, 2013 by David Shields. Average Reading Time: about 3 minutes. 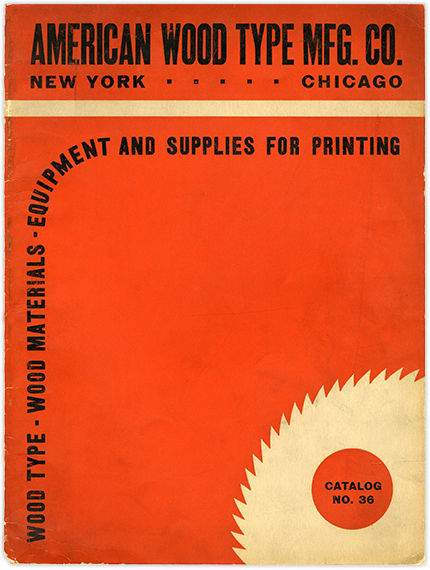 American Wood Type Mfg Co published it’s Catalog No 36 in 1936. Their primary business address was listed as 270 Lafayette Street, New York and the secondary address listed as 608 Dearborn Street, Chicago. The specimen book interior is printed in black ink on off-white uncoated stock, with a 2-color cover that is slightly heavier than the interior stock. The catalog measures 10¼ × 13¾″ and is thirty-six saddle-stitched pages plus cover. All pages are numbered with folios appearing on the lower outside corner. The particular copy of Catalog No 36 that is held at the corporate archives of the American Printing Equipment & Supply Co in Elmont, New York, also includes an additional unnumbered signature, adding four pages to the catalog. The specimen book includes thirty-four different type designs, all typical mid-century offerings predominantly made up of Gothics but also a selection of Coopers, Cheltenhams, Fat Faces, Brush Scripts and one Slab Serif. The catalog also includes borders, plain geometric ornaments, calendar sets and price cuts. It includes specimens sized from 4-line to 36-line, while the price list indicates that sizes up to 100-line can be cut to order. The faces highlighted with bold in this list were not shown previously in American’s 1934 catalog. 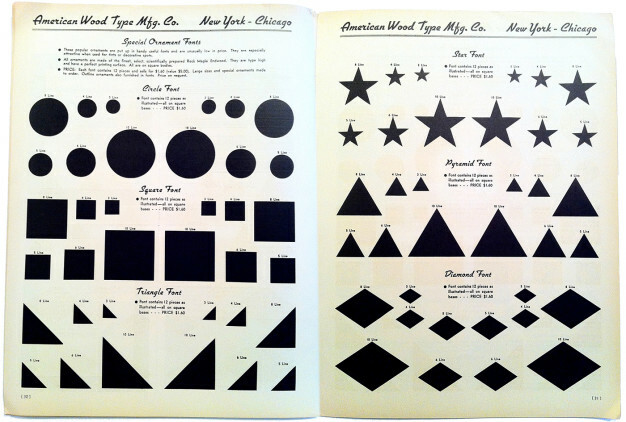 As American Wood Type Mfg Co acquired the Empire Wood Type Co some time in 1936 it might be inferred—though it is not explicitly stated in the catalog—that these faces represent designs newly acquired from the Empire purchase. 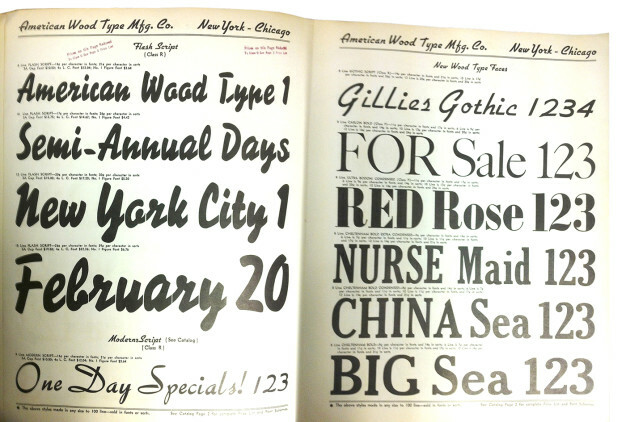 This cannot be confirmed conclusively until printed specimens of Empire Wood Type Co offerings are discovered. It should be noted that several faces—including the Gothic Script, Caslon Bold, Ultra Bodoni Condensed and the Cheltenham family—are shown on a page labeled ‘New Wood Type Faces’ which could lend further support to these coming from the Empire acquisition. 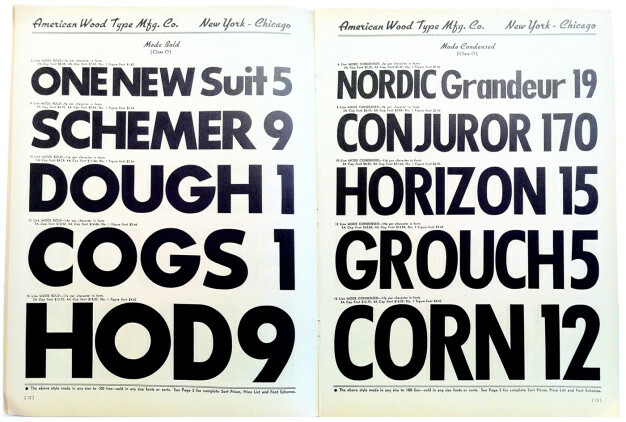 It is interesting to note that Catalog No 36 was the first time American Wood Type Mfg Co showed script faces. None of the designs were unique to American and each design was accompanied by text indicating the popular foundry design to which it was similar. It is not clear, though, if any of the copies were officially licensed. American’s Modern Script was a version of Trafton Script, as directly stated in the catalog “[t]his attractive type face is similar to the popular Trafton Script metal type.” Trafton Script was originally designed by Howard Allen Trafton of New York in 1933, and first cut as a metal type by the Bauer Type Foundry1. Flash Script appears very closely related to Berthold’s Signal. Signal was originally designed by Walter Wege in three weights for the Berthold Type Foundry in 19312 The third script shown, Gothic Script, appears closely related to Gilles Gothic—it should be noted that while the catalog does not mention the face’s resemblance to Gilles, the specimen letters, shown in 8-line, spell out “Gilles Gothic 1234”. It is also important to note that Gothic Script was not shown in any subsequent American Wood Type Mfg Co specimen books after 1936. Gilles Gothic was originally designed by William S Gilles of New York in 1935 and cut as a metal type by the Bauer Type Foundry3. Special thanks to David Wolske for permission to use his image of the Catalog No 36 cover. Mr Wolske maintains the ever excellent Letterpress Daily. Make sure to check out his regular Specimen Sunday post.